Hey Sensitive Creative! Feeling Stuck? Passion Isn't Your Problem, it's Purpose. — Andrea O. This is one goes out to all the sensitive creatives who are waiting to start. I know you're not short on passion. You've got loads of passion and talent, you're just figuring out how to use it and truly, your options are endless. So, you're drifting. You might have an okay job (you might not), you might not be acutely miserable, but you're waiting. "When is my life going to start?" You've seen it in the movies or with your friends: Girl goes to college, girl graduates college, girl starts amazing career, girl lives incredible, fulfilling life with 10 close friends she somehow found after college. The thing is, that's not how it usually works. It's normal to feel a little lost in the transition as you embrace your independence & go it alone, ESPECIALLY if you're multi-passionate. And since nobody really talks about this transition, it's really easy to feel like you're completely alone. You just need some clarity. Some time with yourself to ask the right questions & move yourself forward, some space to make mistakes, and maybe a lot of hot tea to keep you cozy. At least, that's what I needed. My rock bottom looked like this: 22, divorced, alone for the first time in my life, a tiny disaster of an apartment, a job I hated & what felt like 1000 pointless dates with men that made me feel even a little less alone. Yeah, 8 months of that while I scrambled my life together & struggled my little heart out. The worst part was the crushing feeling I had in my chest that I felt front and centre when I'd ask "what am I doing with my life?" But, I figured it out. it took me almost a year to pull myself out of it, with a lot of mistakes & steps backward, but I did it. Planning my next moves involved a lot of really painful time alone with myself & it wasn't a straight line, but eventually I started asking myself the right questions & I pulled myself out, bit by bit. And you probably know, it started with how I looked at myself & my life, then it grew to a new home, partner, car, cat and a ton of plants. I'd love to say that those things made me happy, but I was already happy by the time those things came around. It took a lot of work to get me there, though, and it definitely wasn't easy figuring it out by myself. But, the thing is, I knew a lot of sensitive creatives that I surrounded myself with needed to do this work. I felt proud that I'd figured it out on my own, but I knew there had to be an easier way for other creatives who went through the same quarter-life crisis I went through. Eventually (AKA 3 years later) I felt comfortable enough to start sharing what I learned. Now, as a purpose-driven joy + productivity strategist, I finally felt ready to share my game-changing strategy in my new course: Dream Life 101: Find Your Bliss + Feel It Hard. 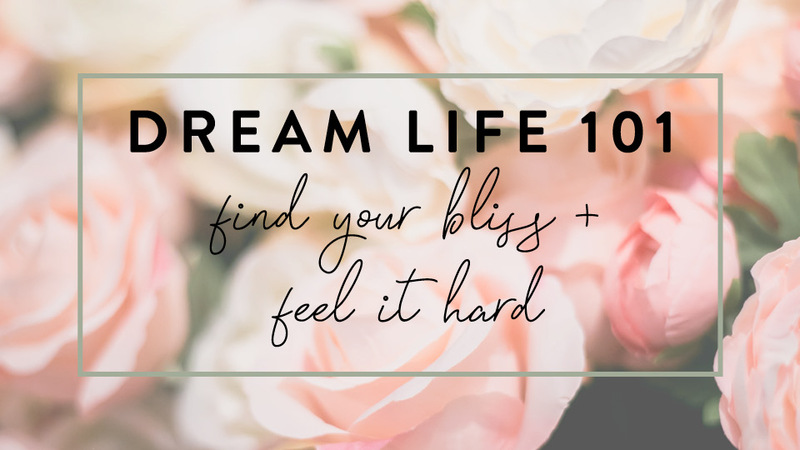 Dream Life 101: Find Your Bliss + Feel It Hard is a great resource for people feeling stuck & overwhelmed with their potential. It's a self-paced, online course with the mindset & strategy that I used to get myself moving and out of my rut. It goes over the mental shifts you need to make when you're trying to level up AND tips & strategy to actually make it happen. I created it to be almost like a digital guidebook, you have lifetime access so that if you need a little more support, you can go back to it as you grow & change.